Beverly - John A. Paddol 86, beloved husband of the late Joan F. (Brown) Paddol, died Friday, November 23, 2018 at his home. Born in Detroit, Michigan, he was the son of the late John F. Paddol and Lena (Woog) Paddol Sulski. He received his education in the Beverly School system and graduated from Beverly High School, class of 1950. Mr. Paddol had been employed for many years as a mason, having worked for C.B. Ganey Masonry where he made many great friends. He had also worked at the Beverly-Salem Water Filtration Plant in Beverly. A longtime resident of Beverly, he was a lifelong member of the Beverly Elks and a member of the Franco American Club. 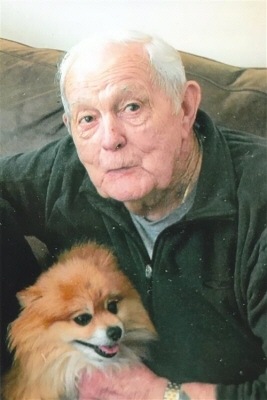 John enjoyed playing golf, fishing and walking his constant companion, his Pomeranian dog, “Sailor”. He especially enjoyed spending time with his family whether it was at home, camping, fishing or on vacation. He was a loving father, grandfather, great grandfather and friend who will be missed by all who knew him. Many thanks from his family to VNA Care Hospice and especially his nurse, Mary, Dr. Shih, Dr. Mouchantaf and all their staff. He was the beloved father of seven children, Leann Larochelle and her husband, Roger, John Paddol and his wife, Jean, Michael Paddol and his wife, Nancy, Andrea Cagney, Irene Tassone, Jay Paddol and his wife, Jill and Michael Regan and his wife, Judy, sixteen grandchildren and sixteen great grandchildren whom he cherished. He was predeceased by his son-in-law, James Cagney. His funeral service will be held at the Campbell Funeral Home, 525 Cabot Street, Beverly, Thursday, November 29, 2018 at 6:00 p.m. Relatives and friends are invited to attend. Visiting hours will be held prior to the service on Thursday from 4 to 6 p.m. In lieu of flowers, expressions of sympathy may be made in his memory to the Northeast Animal Shelter, 347 Highland Ave., Salem, MA 01970. Information, directions, condolences at www.campbellfuneral.com. To send flowers or a remembrance gift to the family of John A. Paddol, please visit our Tribute Store. "Email Address" would like to share the life celebration of John A. Paddol. Click on the "link" to go to share a favorite memory or leave a condolence message for the family.